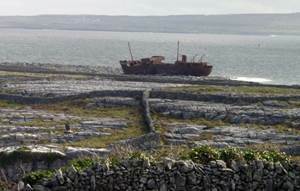 Inis Oirr, which is the smallest of the Aran Islands and has about 250 residents, does not have a suitable harbour in which to leave a yacht unattended. The new pier is used by the ferry, but even on a calm day, the amount of swell coming into the harbour made that berth rather boisterous. When the wind picked up, the exposed anchorage, harbour, and beach area made for a very uncomfortable chop. 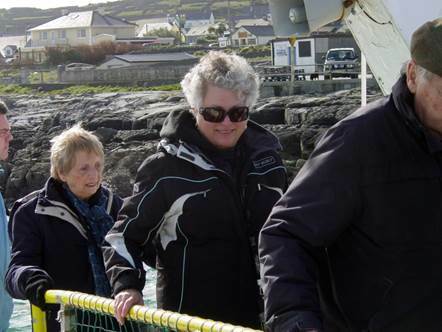 The best way to visit Inis Oirr (Inisheer) is by ferry from the mainland or from Inis Maan. 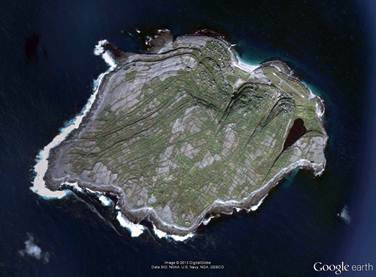 Houses are built in clusters on the north side of the island which is sheltered. There are five villages: Baile Thiar, Baile an Lurgain, Baile an tSéipéil, Baile an Chaisleáin and Baile an Fhormna. The island is within the Gaeltacht, the Irish speaking area of the West, and some of the islanders do not have a great command of English. They are very welcoming and do their best to accommodate visitors. Walking the loops on the island is a great activity on a good weather day. The walks are relatively easy and mostly along paved roads and boreens. 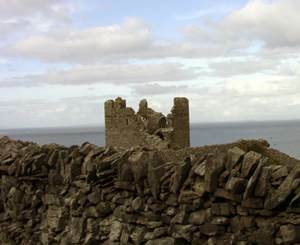 The main attractions are the wreck of the Plassy, the Lighthouse, St. Coamhans Church, and O’Brien’s Castle and the signal tower. The views over the harbour are spectacular. The beach at the base of the village is long and lovely with water clear as ice and the colour of Caribbean blues and greens. Currachs were stored there on beer barrels, which seemed like a very fitting combination. The Plassy started life as the HMT Juliet, a steam trawler launched in 1940. On the 8th of March 1960, while sailing from Galway to Fenit with a cargo of whiskey, stained glass, and yarn, she was caught in a SE gale and ran onto Finnis Rock. 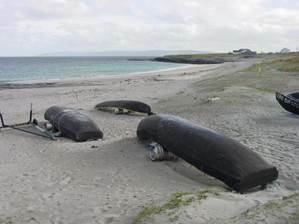 The crew of eleven were taken safely off using a breeches buoy, the first time it was ever used in Ireland. She then was lifted onto the island in a second storm two years later where she rests until today. We forgot to ask what happened to the cargo but we hope the whiskey at least was saved. Walking the island one wonders how the islanders ever eked a living off the island. 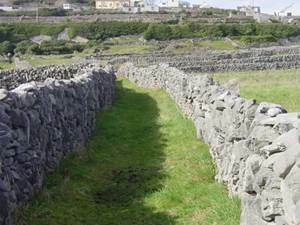 Even today, there are few sheep or cattle in evidence, the amount of rock in the walls is astounding, and the practice of creating soil in lazy beds made of seaweed and sand is impressive. 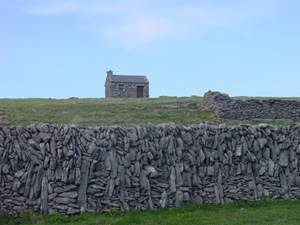 The walls of Inis Oirr are massive and yet many fields still lie buried under rock. Early in March, we were fortunate enough to witness a spectacle the likes of which none of us had ever seen. 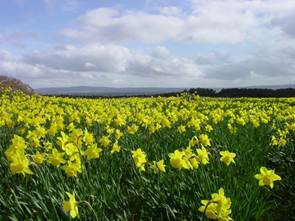 Two fields, isolated from all the others, tightly abloom with millions of daffodils. The vibrant colour and life of the floral display against the starkness and harshness of the rock walls was cause to stop, admire and wonder with sheer joy. Across from the fields was a beautiful lake (An Loch Mor) with rocky shore punctuated by standing stones. 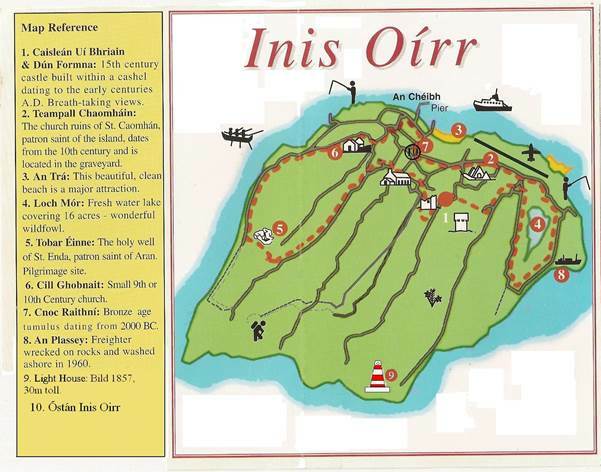 Amenities on the island include an arts and cultural centre, well provisioned shop, post office, campsite, bike hire, health clinic, library, pubs, Catholic Church, cafes and restaurants, a hotel, hostel, B&Bs, two schools and a co- operative. There is also a craft centre and heritage home, but they were not open when we were there. 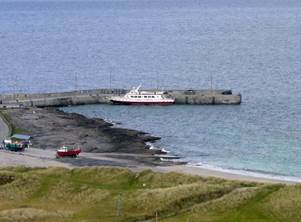 The Hotel Inis Oirr Facilities include a restaurant, bar and lounge. The dining room overlooks a castle and serves fresh local seafood with full wine and bar facilities on request for non-residents. (http://www.hotelinisoirr.com/) We stopped at the Fisherman’s Cottage for lunch which was delightful. The best local fish cakes with bottled beer washed down well. It is not easy to find however, as it is tucked in at the end of the road just before the road turns back towards the harbour. Look for a carved stone in the wall announcing its presence. On the short walk from there to the harbour, we were early for the ferry and stopped in for a pint at Tigh Ned’s for pints. Those interested in Six Nations were glued to the big screen in front of a roaring fire while we studied the many historical photos and objects on display. A very comfortable pub it was in which to pass an hour or so. The ride back on the ferry, which has seen better days, was not quite so comfortable, as the seas had kicked up quite a fuss while we waited. 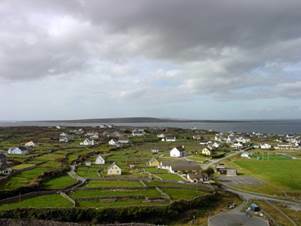 All in all, it was a fine spring day on Inis Oirr and we thank the residents for their welcome.